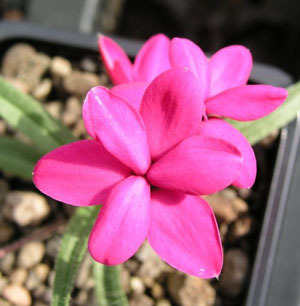 Rhodohypoxis (from the family Hypoxidaceae) originated in South Africa, mostly where there are high summer rainfall and dry winters near the Cape and Natal. In their natural habitat they can be found on open grassy slopes in areas of high altitude. They are technically not "bulbs" but a type of corm like small tubers. Each of these tiny tubers sends out lush green strap like foliage in early Spring. The leaves are slightly hairy - this helps the plants from drying out in their natural habitat; the tiny hairs trap rain droplets and channel the rain down to the centre of the corms. From April to August you will get a succession of tiny star like flowers ranging in colours of pink and white to dark reds. Rhodohypoxis only grows to 5cm in height on average although there are exceptions. Rhodohypoxis deflexa, the smallest Rhodohypoxis only reaches 2cm or less depending on position in your garden and Rhodohypoxis 'Tetra White', sometimes called 'Helen', reaches 10cm. Rhodohypoxis prefer to be kept moist - do not overwater as this will only rot the small thick tuberous roots. Start watering from beginning of April right through to two weeks after the leaves have gone yellow, usually in September - this is vital to help build up the reserves in the corm for the winter period. If growing Rhodohypoxis in containers then it is easy to lift your pots inside to a cold glasshouse and let the corms dry out. The ideal time for repotting your corms is January. Rhodohypoxis like to grow in clumps; they will not do well if planted singly so when dividing your clumps make sure you plant at least three corms tight together. I use a peat based compost as Rhodohypoxis prefer to grow in slightly acidic conditions about ph 5.5 to 6, so do not add Calcium Carbonate (lime) to your mix but do add dolomite lime (magnesium lime). This is essential for good root development - if there is not enough magnesium in your mix you will get nutrient lock up, in other words major nutrients like Potash and Potassium will remain insoluble in the compost and your plant will not be able to get the required nutrients in the correct balance. So to 40 litres of sphagnum moss peat add 20 litres of horticultural grit - make sure it is lime free grit about 4mm in size. Then add 90grams of Dolomite lime and 120grams to 130grams of Osmocote (slow release fertiliser). I plant the corms in 7cm square pots at twice the depth of the tuber and only lightly cover the corm with the potting mix, then top dress the pot with grit in larger containers. You might want to add a wire mesh above the tubers, this is to help prevent mice from getting at the corms over the winter months. I then place the pots in trays on a bench which is south facing but I give shade from the East. The reason for this shade is to help prevent the pots from warming up too quick in the spring mornings as this would only force the corms on too quick and then they would get checked by a late frost. The other reason for the shade from the East is to keep the intense colour of the flowers - deep reds require 40% shade to maintain their true colour, full south facing sun will bleach the colour of the flowers. Pink and white forms are ok in full sun. 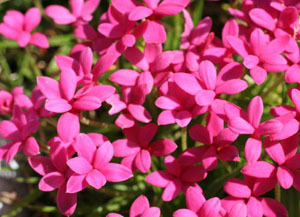 During active growth make sure to keep the plants well watered, although this is not a problem in Ireland with all the rain we get, and rain water is by far the best for Rhodohypoxis as they like acidic conditions. I only water late in the evenings during the summer months as water sitting on the small flowers will act as small magnifying glasses and in strong sun will burn the delicate flower petals. Rhodohypoxis are much hardier than the gardening books would make you believe, they will survive in the ground down to -5 degree Celsius provided they have a very free draining soil and are shaded from early morning sun. To do this all you need is a well positioned small rock on the east side of the plant. Rhodohypoxis are very floriferous, repeat flowering from April/May to August. It is a good idea to remove dead flowers with their stems, as the dead flowers tend to sit over the new flower buds trying to push their way up through the foliage, and if these dead flowers and stem are wet for prolonged periods this will rot the young buds below them. 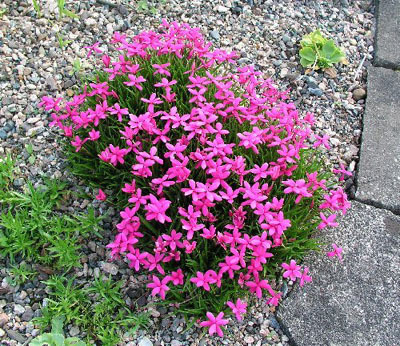 When planting Rhodohypoxis in the ground use the same potting mix as mentioned above but this time use a larger grit onto gravel size to mulch the top of the soil; about a 10mm gravel is ideal and preferably a dark coloured gravel is best to show off the flowers to their best potential. In recent years nurserymen are trying to breed double flowers and they have succeeded. 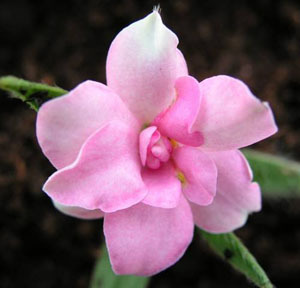 'Lilly Jean' as in the photograph is a very good example of a clear pink double; these are best grown in containers and protected from excess rain to maintain the flowers for a longer period. There are other doubles coming onto the market but most are short lived. So far 'Lilly Jean' has done well, I have had it for four years now and surviving well. It is hard to get another alpine plant that will bloom for such a long time and consistently put on a "good show" - they are a real show stopper. Rhodohypoxis 'E.A. Bowles' is a very good example, the pink flowers form a lovely tight clump as in the top photograph.